According to the gov.uk website, one in five children are overweight or obese by the time they start reception class and this rises to one in three by the end of primary school. For many children, this is due not only to poor diet and a lack of exercise but also because they lack enthusiasm for physical activity. Challenging this early, before they start school, can bring a number of important benefits and in this post, we’ll look at what they are. Even at such a young age, outdoor play can have a positive impact on a child’s fitness. Indeed, it is as important at this age as it is at any other. Though most preschool children will be happy running around having fun in the playground, providing them with equipment that allows them to increase their activity levels and which requires them to use their strength can improve fitness even more. Good examples include climbing equipment, which is great for developing strength and sports markings which can encourage aerobic activity. Giving children the opportunity to participate in active play is a great way for them to discover the joy of exercise. Unlike PE, which is imposed upon children and can often put them off taking part, free play on outdoor play equipment can engender a passion for activity. This can help change attitudes to sport and physical activity over the long-term, setting up the child for a healthy lifestyle in the future. 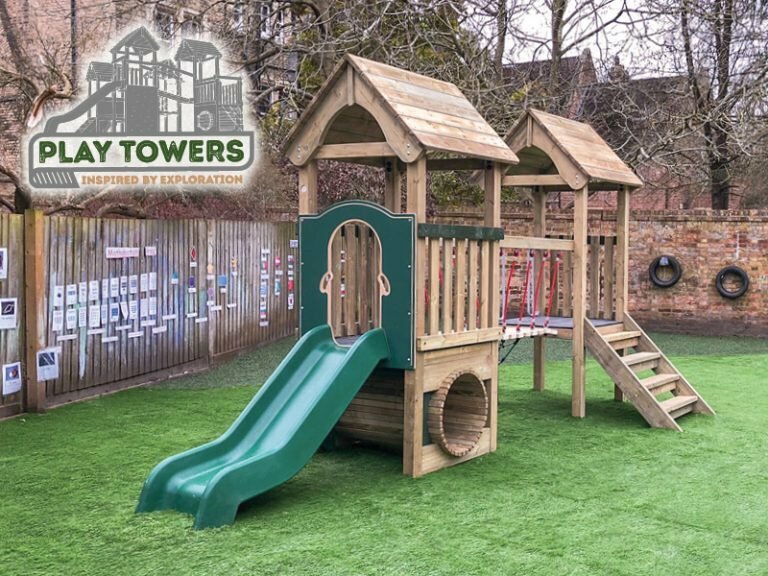 Equipment such as Trim Trail obstacle courses and play towers are great fun to play on and perfect for active role play. Balance and coordination are two key physical skills which children will rely on as they move into primary school. There are some exceptionally good pieces of playground equipment that can be used to motivate children to take part in activities that help bring these skills along. In particular, our Free Flow and Tangled apparatus all provide exciting ways for children to practice balancing and to coordinate different parts of the body as they play. One of the advantages of outdoor play is that children get to burn off calories while they are being active. While diet certainly plays a part in obesity, the reason so many people are overweight is that we consume more calories than we use. Even children with a healthy diet can become overweight if they do not exercise enough. To ensure that children burn more of the calories they eat, it is recommended that they do 60 minutes of moderate to vigorous physical activity every day. Providing stimulating outdoor equipment that gets them running, jumping, swinging and climbing can contribute significantly to that 60-minute goal and, in doing so, help them maintain a healthy weight. It’s not just a child’s physical development that is improved by taking part in active outdoor play. Studies have shown that it is also an excellent way to help children develop their social skills. When playing in groups, children are placed into situations where they have to communicate and work together and this helps to start the development of skills they will rely on later in life. A clever selection of the right playground equipment can help preschool children learn to turn take, negotiate, encourage and support one and other. Imaginative, sports and role play equipment are all useful in different ways and a combination of these can have a significant impact in accelerating the early development of these skills. One of the great things about active free play is that it gives children the opportunity to do things for themselves. Given the right types of equipment, this can help children become more independent, confident and resilient. 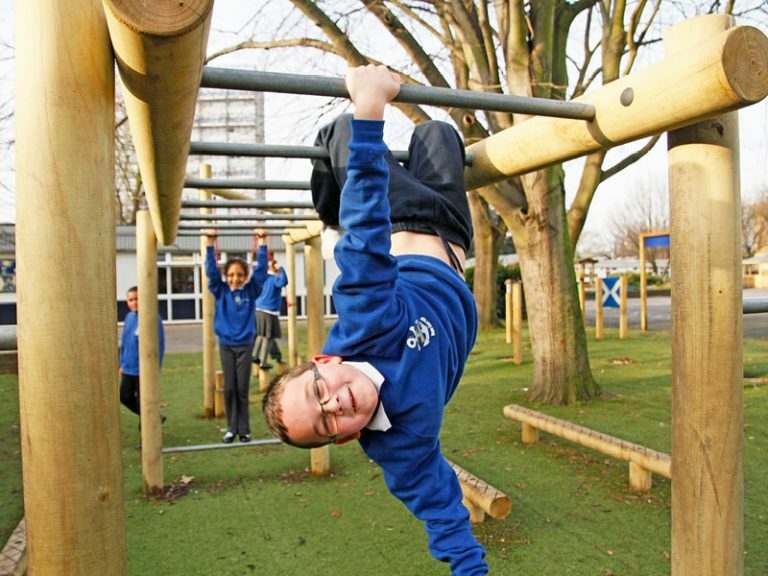 Equipment such as Trim Trails and climbing frames are excellent for this as they present challenges that, when successfully completed, make children feel confident about their abilities. And by overcoming minor setbacks, such as not being able to conquer an obstacle first time, they develop resilience. In addition, these types of equipment help foster independence. Children choose the pathway across the Trim Trail or climbing frame that is best for them and to do this, they have to make their own, independent decisions about which apparatus to play on, which route they will take and how to tackle the challenges it throws. Active outdoor play has lots of benefits for preschool children, especially when appropriate play equipment is provided. It benefits their physical health, improving fitness, developing balance and coordination, maintaining healthy body weight and creating a positive attitude towards physical exercise. In addition, it helps the development of social skills as well as bringing on increased confidence, resilience and independence. If you are looking to improve your preschool playground, check out our range of products or look at our free playground design service.